With the Houses of Parliament requiring costly renovation, new research suggests we may have something to learn from plans in the 1730s to rebuild the Palace of Westminster. Over the course of the next decade, Kent submitted a succession of plans ranging from a complete rebuild to a salvage operation. They came to nothing. By 1742, the coffers had been drained by war with Spain and British embroilment in the War of Austrian Succession. Kent’s political champion, Prime Minister Robert Walpole – advocate of the Palladian style of architecture appropriated by the Whigs to articulate the values of order, reason and clarity to which they aspired – was toppled. 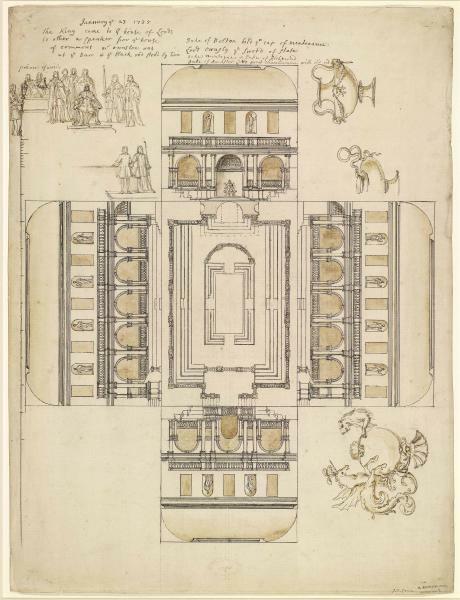 But Kent’s legacy of 80 drawings, suggests art historian Dr Frank Salmon, might in some respects represent the best Houses of Parliament the ‘Mother of all Parliaments’ never had. Salmon’s analysis of these meticulously drafted documents has, moreover, led him to revise his convictions about good public architecture, and its perception in Georgian Britain. So what can we glean from Salmon’s reconstruction – and deconstruction – of Kent’s symmetrical arrangements of Corinthian columns, pediments, Venetian windows, white Portland Stone rusticated ground floors and imposing first floors that typify English Palladianism? Although too small to accommodate today’s Parliamentary business, Kent’s building would nevertheless have been imposing. At 444 ft long and parallel to the River Thames in one plan, its towering columns and dome would have dominated the city. In a later plan, with a huge central tower, it would have projected far enough into the Thames to require embankment. It would, for the first time, have presented the home of government as a unified entity. At a time when the Commons was beginning to sit along party lines, “Kent’s Commons would have been amphitheatrical, although he retained the biaxial Lords,” said Salmon. “In one plan, a section of seats was angled, perhaps set aside for the Cabinet.” In what seems a strikingly literal assertion of authority, the Speaker’s throne protruded into the middle of the Chamber. There would have been space for spectators; although, with a ban on Parliamentary reporting in the press reinforced in 1738, the purpose here is opaque. Unlike Westminster today, where the labyrinthine corridors of power would stretch to three miles if placed end-to-end, Kent’s building would have been relatively easy to negotiate. Its classical proportions and suites of adjoining rooms would have made a virtue of light and space – for some: Salmon has discerned designs for communal toilets for male servants, in contrast with comparatively more luxurious accommodation above stairs. If Kent’s existing Horse Guards building is anything to go by, his Parliament would have been relatively sustainable compared with today’s building, which presents a ‘looming crisis’ according to a recent Parliamentary Report, ridden with asbestos, with antiquated heating and drainage, and sinking into the ground. As for Kent the architect, Salmon’s research represents a substantial reappraisal of Kent’s position in our cultural history. The exuberant, erratic parvenu of some depictions comes across as “a highly professional, competent architect rooted in reality”, according to Salmon, positioning facilities with a view to the paths that the myriad personnel who make up the ecology of parliament would need to trace through the building. 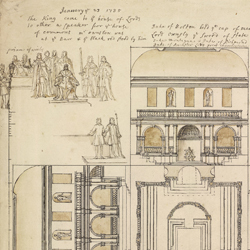 Perhaps Kent’s charming habit of doodling in the margins of his plans the parliamentary personalities who populated his imagination helped make his architecture sympathetic to those who would inhabit it. Salmon’s research has recently been published by Yale University Press as part of a major retrospective on William Kent in the context of the tercentenary of the Hanoverian succession. Publication coincides with a substantial exhibition of Kent’s work at the Bard Center New York, which will move to the Victoria and Albert Museum in Spring 2014. Pallid Palladianism or classy classicism? Members of the public will be able to assess for themselves the grand designs that would – architecturally – have brought a sense of proportion to Parliament.